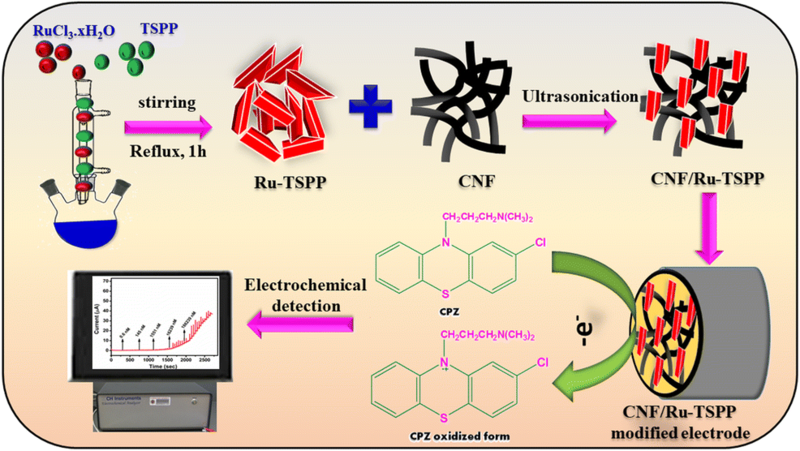 A carbon nanofiber functionalized with ruthenium(II)-tetrasulfonato phenyl porphine (CNF/Ru-TSPP) is shown to be viable sensor for amperometric determination of the antipsychotic drug chlorpromazine (CPZ). 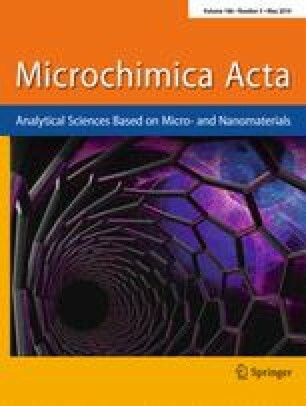 The hollow platelet structured Ru-TSPP combines with the hollow cylindrical tube-like structure of the CNF via π stacking interaction. The morphological and electro conductive properties of the electrode were characterized by spectrophotometric techniques. The CNF/Ru-TSPP modified electrode displays a large surface-to-volume ratio, good electron transport and good electrocatalytic activity. The amperometric sensor, typically operated at a potential 0.63 V (vs. Ag/AgCl) exhibits a linear response in the 0.6 nM to 1.1 mM CPZ concentration range, has a 0.2 nM detection limit, and a remarkably good electrochemical sensitivity (2.405 μA μM−1 cm−2). The sensor is selective, repeatable and reproducible. It was successfully applied to the determination of CPZ in spiked serum samples. Schematic presentation of carbon nanofiber/ tetrasulfonatophenyl Ruthenium(II)porphine (CNF/Ru-TSPP) nanocomposite synthesis and application for the electrochemical determination of chlorpromazine (CPZ). The online version of this article ( https://doi.org/10.1007/s00604-019-3384-y) contains supplementary material, which is available to authorized users. This project was supported by the Ministry of Science and Technology (MOST 107-2113-M- 027-005-MY3), Taiwan, ROC.